The Saint Nicholas Inn is located in a turn of the century townhouse in the stunning historic Sugar Hill district of Harlem, NY. Conspicuously set back from the sidewalk, the Inn boast a dazzling red brick façade, and original details including hardwood floors, intricate moldings, and original mantles. View famed Yankee Stadium from your front window and get to it within 10 minutes via public transportation. 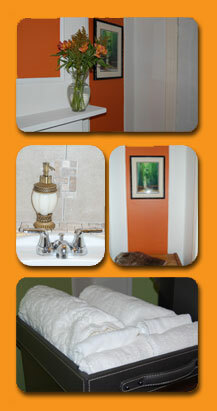 Come and enjoy the comforts of our charming Inn. We have five spacious rooms, one of which has a private bath, kitchen and lounge area. Enjoy all that New York City has to offer via train or bus (both footsteps away). Ample transportation is available via the A, C, B, D and 1 trains or car service.